In 2015 I wrote, mostly. 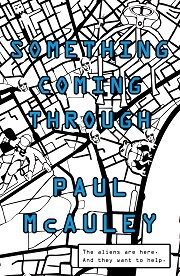 First up, a new novel, Something Coming Through, which brought together some ideas I've been working up in short stories for the past ten years or so. About the way that technology has become a cargo cult that is changing us in ways we can neither predict nor, as yet, fully understand. About what might happen if we were given free and easy travel to other planets right now. About mysteriously helpful aliens, the Jackaroo, and what happens when the Other understands you better than you understand yourself. I finished writing a second Jackaroo novel, Into Everywhere, in the first half of this year. It's related to Something Coming Through but works as a standalone, and is scheduled to be published in April 2016, a couple of months after the mass market paperback of Something Coming Through and a couple of months before Fairyland is reissued as a Gollancz SF Masterwork. 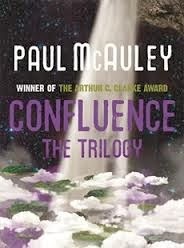 Also published in 2015, a big fat paperback of the Confluence trilogy, reissued with two associated stories. Some people think that it's my best work. I'm pleased to see it back in print after a long hiatus. And I turned two out-of-print novels, Players and Mind's Eye, into ebooks - Kindle only, at the moment, I'm afraid. Players is a police procedural revolving around a massively multiplayer online game. Mind's Eye is a weird thriller that moves from London to Iraq in a chase after the origin of mind-altering entoptic glyphs and the strange family history of its protagonist. There was a smattering of non-fiction, and two short stories, 'Planet of Fear' (in Old Venus, edited by G.R.R. Martin and Gardner Dozois) and 'Wild Honey' (in Asimov's SF). Both have been selected for upcoming Best of the Year anthologies. I also wrote, and sold, four short stories that should see print in 2016, and I'm in the middle of writing a novel I don't want to talk about for the usual superstitious reasons, except to say that it's one I've been trying to find way of writing for some time. Based on previous years, I could predict that I'll spend much of 2016 writing, too, but one thing I've learned from writing science fiction is that making predictions is a chancy business. Meanwhile, a Happy New Year to all who've stopped by here. Let's hope it's a good one. In the gardens of my childhood, a subdivided acre behind the row of four rented cottages, I was digging in the soft deep dirt for lugworms, usually found in the intertidal sand of beaches. I excavated one and dropped it in a plastic bag with an inch of seawater in the bottom, but abandoned the search when I uncovered a hollow chamber the size and shape of a child's balloon -- I was afraid of being attacked by the bees which I knew had made it. With the kind of narrative skip common in dreams, I noticed that the sports field next to the gardens had been dug up to reveal the salt dome beneath. Workmen were carving the white salt into a replica of the hills that rose above our little valley. So far, they'd only roughed out the contours, and created a miniature of the parish church. The tall wire mesh boundary fence was gone and big hawthorn bushes had been planted in its place, each bent like an elbow, to create the beginnings of a hedge. I walked along it, towards my childhood home. And then I woke up.